Although Taijiquan (Tai Chi Chuan) traditionally has no ranking system, I felt it was necessary to create this system to make sure my curriculum is structured and my students get the most out of their training. This system not only allows my students and me to keep track of their progress, it also encourages each student to continue training each skill that they learn. As you can see from the list of requirements there are 3 levels to each rank. When a student tests for the 2nd level of a rank, they must retest the 1st level skills. When they test for a 3rd level, they must retest the 1st and 2nd level skills. This encourages each student to review and refresh his or her skills frequently, and facilitates better learning. When a student is moving from the "beginner ranks" (white - orange) to the "intermediate ranks" (purple - blue) they must retest all skills learned in the "beginner" section, then test for their 1st level Purple Rank. When a student is moving from the "intermediate ranks" (purple - blue) to the "advanced ranks" (red - black) they must retest all of the "beginner" and "intermediate" skills, then test for the 1st level Red Rank. 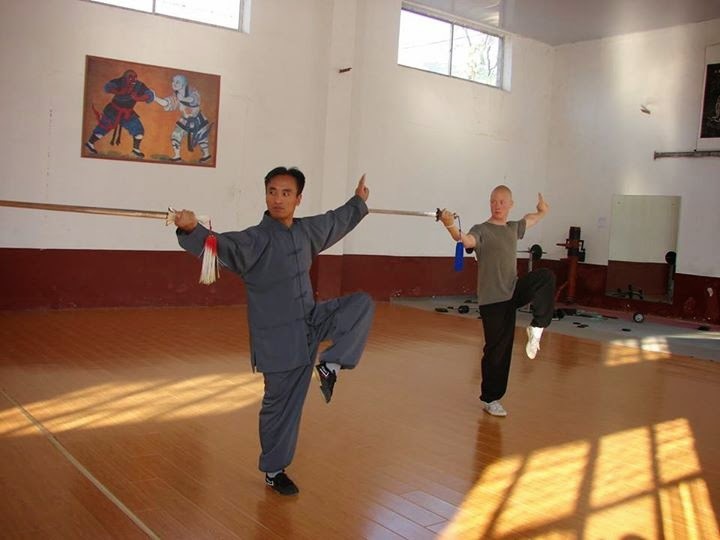 My desire is to make my students fully capable to teaching Taijiquan (Tai Chi Chuan) and Qigong anywhere in the world and be able to offer real substance to anyone interested in learning from them by the time they reach their Instructor Rank. But I do want to emphasize that the ranks are not the point here. The knowledge and skills are the point and the ranks are just a way to offer structured learning and accomplishment recognition for my students. I do require my students to test unless doing so violates their personal beliefs. Testing should not be stressful, but rather a fun experience where each student gets to show what they have learned. I encourage my Tai Chi for Health students to think of it more as "Show and Tell" rather than and examination. Some of the testing will seem slightly physically demanding, but this is a good measure by which a student can assess their progress. Required Book for Testing Students: Students wishing to earn rank will need to purchase the book, Tai Chi--The Perfect Exercise: Finding Health, Happiness, Balance, and Strength by Shifu Arthur Rosenfeld, before their first test because there will be required reading from this book for each rank test. I understand that people have busy lives and I am not trying to make life more hectic by assigning “homework,” which is why the required reading sections only need to be completed before rank tests. There are usually several months that pass between tests, so the small amount of reading should be very easy to complete. When I read this book I was very impressed with the way in which the author presented many of the foundational concepts of Tai Chi in very easy-to-understand terms. He covers just about every basic concept you will need for your Tai Chi training and does so with respect to other styles and points of view. I feel that this book will not only help clarify questions, but also act as an aid to your practice times away from class. There will not be a written portion to the rank tests, so the information in the required reading section of the rank test is for your deeper understanding of Tai Chi. The only proof of reading that I will require is that you bring your copy of the book to each rank test and that you verbally affirm that you have completed the reading required for that test. On a final note, it should be remembered that this book is written by a practitioner of Chen Style Tai Chi Chuan, while our learning is a mixture of Chen Style and Yang Style Tai Chi Chuan. This is important to note because some of the things in the book will not fit exactly with what we do, but the concepts contained in the book are beneficial regardless of style. So you will come across things in your reading that are different, but I see this as a benefit because it will cause you to form questions that you might not have thought of otherwise, and it will give you a wider perspective of the world of Tai Chi beyond what we do in class. That being said, this is a book that I would recommend to all of my students, whether they are planning to test or not. Below is a list of Ranks and the Required Skills in Which a Student Must be Proficient to Earn Each Rank. A Small Rectangular Colored Patch worn on the left side collar of a student's uniform indicates their color rank. The student will have a white patch on their left collar and one yin/yang pin on their right collar. When a student advances to a new Color Patch Rank, the old color patch is replaced with the new one and the yin/yang pins are removed until a new level within that color patch rank is achieved. When the White Patch, Level 3 student from above tests for their Yellow Patch, Level 1; Their left collar will have a Yellow Patch on it and their right collar will have no yin/yang pins on it. A yin/yang pin will be added to their right collar when they reach Yellow Patch Level 2, etc. Entire form from beginning to end without stopping. The form should flow smoothly without any pauses to think about where you are or your next move. You should know the form well enough that each move flows into the next naturally. 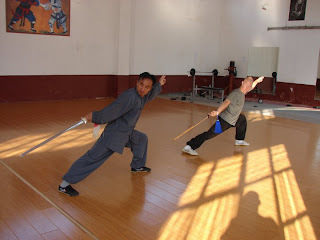 Note: Since this curriculum is not focused on the martial side of Tai Chi, this exercise is to help each student to better understand their own balance. Must explain the concept and show at least two moves from previous training that demonstrate each of the 8 doors. Lead 100 classes, supervised by a person of instructor rank or higher.